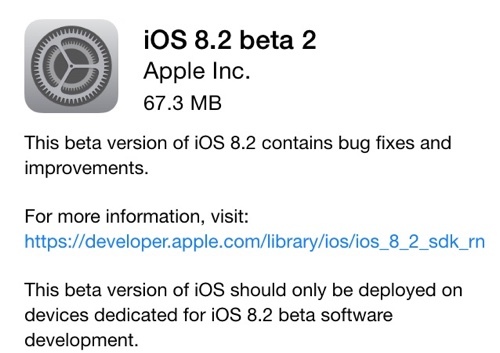 Apple today seeded the second beta of iOS 8.2 to developers, approximately three weeks after releasing the first iOS 8.2 beta. The beta, build 12D445d, is available immediately to registered developers as an over-the-air update and it can also be downloaded from the iOS Developer Center. Today's update also includes Xcode 6.2 beta 2 with WatchKit. According to the release notes, iOS 8.2 beta 2 includes fixes for keyboards that may not appear in Safari, Maps, or other third-party apps in iOS simulator and it offers Siri support for Singapore English. Several WatchKit fixes are bundled in as well, repairing a bug that caused notifications to fail to open an app, an issue that caused WatchKit apps to stop working in iOS 8 simulator, and more. iOS 8.2 includes the WatchKit SDK, allowing developers to create apps, Glances, and notifications for Apple's upcoming wearable device ahead of its 2015 launch. The first iOS 8.2 beta, with WatchKit SDK and developer documentation, revealed several new details about the Apple Watch, including its heavy reliance on the iPhone and the different types of content developers can create for the device. Its so fast now that Safari starts, opens your web page, does your work and exits quicker than before you can take your finger off the screen. Anything new other than fixes? Whatever happened to HomeKit? I have not seen anything about that since launch. When can I control everything through a unified app? Anyone have info on that? Does anyone else hope that this beta restores the fluidity back into iOS. Like iOS 6 once had. The fact that animations are jerky on the iPhone 6/6+ says a lot. Lots of people complaining about bugs. Hopefully iOS 9 will be a "snow leopard" type release. Nothing radical, just some nice new features and a very stable OS. After 8.1.1 made my iPhone 4S feel snappy again, I've run into ZERO problems with iOS 8. I'm very satisfied with this release. It requires iPhone 5 or newer. How bout just ****ing fixing safari? Could give a **** about any of that ********. Won't use chrome because I hate it. I shouldn't have to use any other browser. Safari worked great before iOS 8. Now it's buggy as heck. I just want them to make it work right. I don't think its too much to ask given that it's the most used native app in iOS.